Twenty-two questions on one of the U.S.'s most singular and outstanding authors. 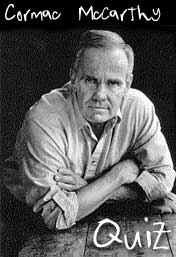 If you think you have them - or close - e-mail your answers by July 10th and win a free book by Cormac McCarthy; the winner may request a copy of McCarthys upcoming novel, although it is not due out until 2003. In case of a tie, a name will be drawn. 1. What was McCarthys given name? 2. In 1974 and 1975 McCarthy worked on which PBS screenplay? 4. In All the Pretty Horses the character named "Abuela" has what relation to John Grady Cole? 8. Where in Spain has McCarthy lived? 9. Which two characters in the Border Trilogy are bilingual? 12. What is the alternate title of Blood Meridian? 13. What was the first university McCarthy attended? 14. Which actor does not appear in the movie All the Pretty Horses? 15. To which novel is the Tatler referring in this cover blurb: "It does for the lupine what All the Pretty Horses does for the equine."? 16. In the novel The Orchard Keeper, who killed Captain Kenneth Rattner? 17. In McCarthys second novel, Outer Dark, where does the tinker find the abandoned child? 18. The death of which character in Cities of the Plain is foreshadowed during Alejandra´s dream in All the Pretty Horses? 19. Name the five-act play in which McCarthy, via a series of monologues, portrays the tribulations of the Telfair family. 21. It features the Kid and the Judge and is like no other Western in all of American literature. What is the novel? a. He told her about Blevins and about the prisión Castelar and he told her about what happened to Rawlins and finally he told her about the cuchillero who had fallen dead in his arms with his knife broken off in his heart. c. He asked the blind man had he heard of others who had suffered the same calamity as he at that mans hands but the blind man only said that he had heard, yes, but had not seen nor met. d. The men as they rode turned black in the sun from the blood on their clothes and their faces and then paled slowly in the rising dust until they assumed once more the color of the land through which they passed. e. The boy had already gone when they came from Knoxville, seven years now after the burial and seven months after the cremation, and sifted the ashes, since whipped to a broth by the rains of that spring and now dried again, caked and crusted, sifted them and there found the chalked sticks and shards of bone gray-white and brittle as ash themselves, and the skull, worm-riddled, vermiculate with the tracery of them and hollowed and fired to the weight and tensile cohesiveness of parched cardboard, the caried teeth rattling in their sockets. f. Id give ten dollars for a glass of icewater, said the city mouse. Cash money. h. Billy watched the light bring up the shapes of the water standing in the fields beyond the roadway. Where do we go when we die? he said. I dont know, the man said. Where are we now?